01:14 - Can computers read our dreams? Can computers read our dreams? Scientists have developed the first system which is able to predict what objects are appearing in peoples' dreams. The team, led by Tomoyasu Horikawa of the ATR Computational Neuroscience Laboratory in Kyoto, Japan, worked with three volunteers, who were invited to try to sleep while lying in a Functional MRI scanner. 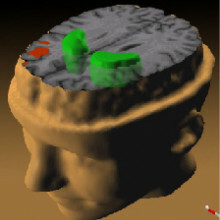 Such scanners are able to map out which areas of a subject's brain are active, by monitoring the flow of oxygenated blood around the brain. The research team fed the brain activity patterns into a computerised pattern-recognition system which searched for correlations between activity in particular brain areas, and reports that the subjects were dreaming about particular subjects. A stumbling block for similar studies in the past has been that dreams are, by definition, internal to the subject's mind. Naturally, it is impossible to hold a conversation with the subjects while they are asleep. This makes it difficult to know when they might be experiencing dreams, or what those dreams might be about. The volunteers who took part in the study were woken from sleep more than 200 times over a ten day period and asked to recount what they were dreaming about. As well as being subjected to these repeatedly reawakenings -- roughly every six minutes -- they were also being asked to try to sleep whilst surrounded by noisy MRI scanning equipment, though headphones were apparently provided to reduce the noise that they were subjected to as much as possible. The research team were particularly interested to see how comparable the patterns of brain activity were when their subjects saw particular visual images during wakefulness, versus when similar objects were encountered in dreams, with the aim of identifying where in the brain dreams originate. To make this comparison, the team used internet search engines to find images of the kinds of objects that their subjects often dreamed about, and mapped out the brain activity of the subjects when they were shown these images while awake. The team found striking similarities between the brain activity recorded in the visual cortices of their subjects between visual experiences had during wakefulness and dreaming, suggesting that the brain's visual processing circuitry is active during dreaming. Of perhaps even greater interest, they also found that by the end of their study, they could predict what objects that were appearing in the dreams of the subjects in around a third of cases. From this, they conclude that they are still a little way away from having a reliable way to evesdrop on people's dreams -- though one reason why their predictions may not have been more accurate is the verbal descriptions given by the subjects may not have reported all of the objects appearing in their dreams: cars are usually associated with street scenes, for example, but the street may have seemed too obvious to mention. However, their work brings together two poorly understood areas of neuroscience: how the brain processes visual information, and what is happening within the brain during dreaming. As lead author Tomoyasu Horikawa points out, the most interesting aspect of this is that the majority of dreams are not remembered; in the future, techniques like this may reveal what people have dreamed about through the course of the night, and how the brain is functioning during those dreams. German scientists have designed a high-efficiency, low-cost lithium-sulphur battery, which they believe will increase the use of electric vehicles in Germany and beyond. Earlier this year, the UK government announced an £11M investment in public and private charging points for electric vehicles, which, its hoped will help increase the popularity of electric cars. At present though, the numbers are still small. According to Germany's Federal Ministry of Transport, there are over 40 million cars on the country's roads, but only a tiny fraction of them - around 6,400 - are powered by electrical energy. The high price of both batteries and vehicles may be a factor in this low uptake, but a more real concern is the comparatively short range of electric cars - their lithium-ion batteries need to be recharged after just 100 km of driving. But a team at the Fraunhofer Institute in Dresden have developed a new lithium-sulphur battery, which is significantly more powerful and less expensive than the standard Li-ion batteries. Previously, lithium-sulphur batteries have had such short lifetimes (just 200 charge-discharge cycles) that they've been unsuitable for use in cars, but the team's new design increases the lifetime of lithium-sulphur batteries by a factor of seven. They have done this by altering the standard combination of anode and cathode material in a lithium battery. The interaction between these electrodes and the liquid electrolyte between them is the critical factor in determining a battery's performance. The team, led by Dr. Holger Althues, replaced the usual lithium anode with one made from a silicon- carbon compound, which is much more stable during the charge-discharge cycle. This improved stability reduces the risk of unwanted interactions between the anode and the electrolyte, which, in extreme conditions can lead to a fatal short circuit within the battery. 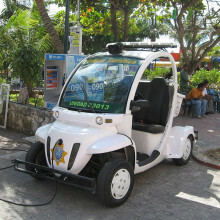 In lithium-ion batteries, the main cathode material is cobalt, a rare, and therefore expensive, material. The Fraunhofer team have replaced the cobalt with elemental sulphur, greatly reducing the cost of the battery. And they have introduced porous carbon into the electrode, which traps the sulphur within the pores, slowing down interactions between the sulphur cathode and the electrolyte. Suitable large-scale manufacturing methods for these Li-S batteries are now under review, but Althues has also shown that, with further optimisation, the energy density of their lithium-sulphur battery can reach 500 Wh/kg - more than double that of the lithium-ion batteries currently in use in electric cars - meaning that for the same weight of battery, you could drive double the distance. A way to conduct X-ray diffraction studies to understand the structure of materials, but without first needing to make crystals of the chemical, has been discovered by scientists in Japan. 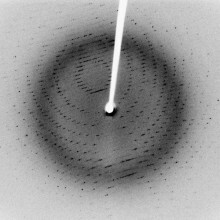 X-ray diffraction is arguably the most powerful way chemists have of looking at the structure of molecules. Rosalind Franklin's x-ray data helped James Watson and Francis Crick crack the structure of DNA; Dorothy Hodgkin used x-rays to see how the atoms are arranged in penicillin and vitamin B12; and the 2013 Nobel prize in chemistry went to researchers studying he structure of proteins using crystallography. But all of these studies require crystals, and not all molecules will crystallise - lots of interesting organic molecules, for example, are liquids or sticky gums. But Yasuhide Inokuma and his team at the University of Tokyo have come up with a way round the problem. They use a molecular sponge to soak up the molecules and hold them in an ordered array. The sponge, or metal organic framework, is made from metal ions joined together in an ordered, porous structure by organic linkers. The molecules being studied all bind to the sponge in the same orientation - similar to how they might pack together in a crystal - which is crucial for x-ray analysis. The technique only requires a tiny amount of material as well - less than 0.1 microgram. That could make it useful for analysing things like molecules extracted from plants or marine sources, which are often starting points for discovering new drugs, but are usually only produced in vanishingly small quantities. A new drug that can overcome insomnia without leaving users feeling hungover the following day is being tested in the US. Although the average doctor's medicine bag is full of drugs capable of sending patients off to sleep, such as diazepam a widely-used benzodiazepine, these agents invariably have serious side effects, including dependency and ensuing daytime difficulties with memory and cognition. This occurs because, as well as activating sleep-inducing circuits in the brain, these agents also suppress the activity of nerve cells responsible for learning, memory and attention. And because, by necessity, the drugs need to have a long duration of action to ensure that, once asleep, the patient remains that way, these other unwanted effects spill-over into the following day's activities, impairing performance. But now scientists have uncovered a class of agent that can trigger sleep exclusively, without hampering other brain activities. Known as DORA-22, short for "dual orexin receptor antagonist", the new agent was first synthesised last year by scientists at the pharmaceutical company Merck, who have now begun testing the drug, with promising results, on rats and monkeys. Writing in Science Translational Medicine, Merck researcher Jason Uslaner and his colleagues have compared the effects on memory, attention and sleep of DORA-22 and the existing sedative agents diazepam, eszopiclone and zolpidem. Rats given the latter drugs were significantly impaired in recall tests and monkeys had poorer working memory and attention. In both animals these side effects occurred at doses much lower than those required to affect sleep. 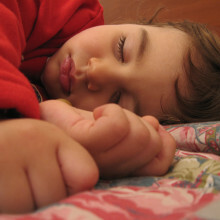 But administration of DORA-22 induced increased sleep at doses 30 times lower than those needed to produce any similar changes in learning, memory or attentional abilities. DORA-22 blocks the action of two nerve signals called orexins, which were discovered in the late 1990s as potent and discrete "wake-up" signals in the brain. Obama announces $100 million to map the brain - but is this enough to fulfill this lofty dream? Dominic - Neuroscience stories seem to be a theme this week as last Tuesday, President Obama announced the brain initiative which offers $100 million of federal funding to map, in detail, the working of individual parts of the human brain. This will obviously provide vital clues in treating diseases like Parkinson's and Alzheimer's. David, Why do you think this wave of funding is coming now for these kinds of conditions? David - Well, it's a prescient topic at the moment, the idea of the aging population. So, the increase in awareness for diseases like Alzheimer's and Parkinson's disease seems to be almost omnipresent. We've got this idea that we need to plough a lot of resources into neuroscience funding so that we can find appropriate treatments for these diseases. Chris - Do you think $100 million - that's about £60 million. Is that really very much? The human genome project cost $2.5 billion and the Wellcome Trust in the UK, a major funding charity gives away £650 million a year. Neuroscience is a big chunk of that admittedly, but $100 million does not sound like very much to do what they're trying to say they want to do. David - No, it's not a phenomenal amount of money and if you look at the original application for this project, it was originally a proposal that was $3 billion. That's obviously been scaled back to $100 million proposal. So, in the modern situation, research and technology is so expensive and consumables that you use in the laboratory are so expensive that that money doesn't necessarily translate into lots and lots of new drugs for us to use. Phillip - Yes, but it is extra money coming in from a source that wasn't there before, so I guess you could say that something is better than nothing. I guess you've got to weigh up, comparing to say, the human genome project, how much do hardware is needed? Can we do a lot of these things with existing techniques so we don't need to necessarily invent new technology? David - I think the idea of raising awareness of neuroscience research is also a really key point here and I think if we can galvanise the youth of today to then enter neuroscience research and feel that this is something that people find as very important, that that's only going to have a net positive effect. Chris - The one thing I'm still concerned about there is the sustainability of this because shovelling in $100 million, it sounds great and it's led to a lot of headlines which is I'm sure, partly what they wanted to do - to inject some 'feel good' factor into US and international global research. But at the same time, that's not very much money to do what they're aspiring to do. It's one thing to start it. It's another to keep these things sustained, isn't it? David - Yes, neuroscience research, like many other areas of research, requires dedication over long periods of time. Sometimes these technologies take decades to go from a conception to the final product. So, we really need to be looking at this over a much longer term. Chris - Lee, what's actually involved in doing what we put in in inverted commas and dub a 'gastric bypass operation'? Lee - Well, you divide the stomach, meaning you cut the stomach so that there's a small pouch made out of the top part of the stomach and that's separated from the rest of the stomach. And then you cut the bowel distally, further down, and you bring it up so that you're emptying that little pouch, that little stomach pouch, directly into the small bowel. So, the food flows through the oesophagus - the swallowing tube - into the small gastric pouch and directly into the middle part of the small bowel, bypassing the rest of the stomach and the first part of the small bowel. And in doing so, it was always thought that what you were doing was preventing people either from eating or absorbing what they ate and now, we know that actually that's not the case. Chris - So critically, the stomach, the residuum of the stomach is left there in situ and the part of the small bowel, the duodenum of the stomach connected to it is still there. It's just that food is bypassing those two anatomical structures and going straight into a part of the small bowel, a bit downstream of there. Lee - Exactly and even though those portions are not seeing food anymore, they seem to be very actively involved in the effects of the bypass. If you simply cut out the stomach, you wouldn't see as much of an effect as you do when you separate the stomach and leave both parts intact or both parts in the body. So, the part that's not seeing food is now sending some kind of a signal to the rest of the body. "You know what? I think we need to sort of change the balance of energy here". Chris - And when people undergo this procedure, roughly, how much weight can they lose? Lee - Well, the average is you'll lose about 2/3 of the excess weight. The weight above what normal would be and there's quite a bit of variation. Some people lose only half that much weight. Some people lose more than that much weight, but on average, it's a highly effective intervention. Much more effective than anything else we've got so far. Chris - So, what was your hypothesis when you came at this study? Lee - Well, some years ago, workers in Jeff Gordon's laboratory in St. Louis, Missouri had found that the microbiota correlates with whether an animal has, or a human being has, obesity or is thin. And further, they showed that if you take the microbiota, the bacteria that live in our bowels from an animal that is fat and you give it to an animal that doesn't have a microbiota, a sterile animal that was grown specially, that animal will gain more weight than if you do the same kind of transfer from an animal that was lean. So, we knew from those experiments that the microbiota was involved in some way in regulating energy balance, body weight, body fat, metabolic function. So we ask the question: Could the gastric bypass be working by changing the total population of bacteria that are in the microbiota? That was the premise and of course, the answer was, yes, we could. Chris - So, how did you actually do that? Lee - First, we asked the question of, how does the microbiota change in response to the bypass and are those changes really from the bypass or are they from the weight loss that the bypass causes? And what we found was that there's a difference in the microbiota between thin animals and fat animals. So, there's difference in the balance of different types of bacteria, but that after a gastric bypass, you actually change it even more so that you get to a third type or a specialised gastric bypass type of microbiota. 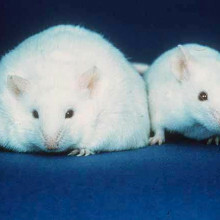 And that change occurs with the gastric bypass, but does not occur when you lose weight by dieting the animals. So that's specific to a bypass. We then took the microbiota from an animal that had gotten a bypass, this changed microbiota, and we put it into another one of these sterile groups, animals with sterile gut. We found that when we did that, those animals lost weight. And again, that effect was specific to the microbiota after gastric bypass because when we did the exact same transfer from an animal that became thin because we put it on a diet, it did not have the same effect in their recipient animal. So, there's something about the microbiota from a bypassed animal that is able to cause a non-bypassed animal to lose weight. Chris - Do you know what's actually going on as a consequence of the operation to trigger that change in the bacterial population that then has this onward effects? Lee - Well, that's a great question and we don't really know the answer. We have hypotheses that the changes in the structure of the gut cause a whole variety of signalling changes. We think that bile acids which are secreted into the lumen of the gut play a role. We think that the mucus layer of the gut, the mucus line, the wall of the bowel plays a role. Just because of the nature of the changes of the bacteria, some of those bacteria that are favoured after bypass preferentially get their energy from that mucus layer. But we don't really know the answer to that. One thing that's important to note however is that the biggest changes that we saw in the microbiota were in the bottom end of the bowel, in the ileum and in the colon which is far removed from where the surgery was. So of course, if you only had changes in the microbiota right where you operated, you might imagine it was some kind of a technical fluke. But here, we're seeing that throughout the bowel, and actually many other parts of the body, the microbiota fundamentally change. So this looks like a systemic effect but we don't yet understand why. Chris - The obvious aspiration is to be able to produce that effect without having to do that fairly dramatic and in many cases, life threatening surgery. Lee - Exactly. I'm not a surgeon but I do take care of many patients who get the surgery. It can be life threatening. Although I have to say that it's a valuable intervention when used in the appropriate patients. In the United States at least and it's actually less in the UK, but in the United States, only 1 in 400 patients with obesity get a gastric bypass. So, rather than thinking about substituting something else for a gastric bypass, I'm much more interested in focusing on those 399 that are not receiving any effective therapy. So, if we could harness the "magic source" of a gastric bypass without the bypass, we could perhaps apply it to some of those 399. Chris - Lee, thank you very much. That's Dr. Lee Kaplan from Massachusetts General Hospital. 24:05 - How do you weigh an ocean? 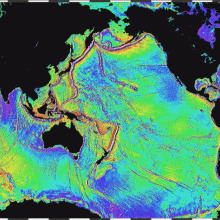 Oceanographers have come up with the unusual idea of weighing the global ocean at a single point to assess how big it is. How do you weigh an ocean? Chris Hughes - We know that the sea level is rising. It's been rising at about 3 millimetres per year for the last 20 years or so and we're pretty certain it's going to continue rising but there are lots of different estimates of how much. So over the 21st Century it might rise by half a metre, a metre, maybe even more. Whether it rises by a lot really depends on how much ice melts. The main source of water is the ice that is locked up in Greenland or in Antarctica which can melt and fill the ocean. But the other way it can rise is you don't have water, it's just the water that's already there expands to take up more space because it is warming up. So we want to be able to separate out the two different sources of sea level rise and in order to do that is for me to measure the mass of the ocean separately from its volume. The mass tells us how much ice is melting, water pouring off the continents, whereas the volume tells us about the density change as well so we need to separate the two out to understand what is happening. Sue Nelson - So is this why you want to actually build an instrument or device that would in a conventional sense of the word, quite literally, weigh the ocean by going on the seabed on the seafloor? Chris Hughes - Yes, that's right. It gave us quite a surprise to find that this might even be possible. When you look at the sea level problem altimetry has been brilliant because it has measured the entire ocean, so the satellite measures almost the whole world and we know because we're measuring everywhere that we're measuring the global picture. If you don't measure the global picture you don't get the total. The ocean sloshes around in a very complicated way and if you just measured it at one place you wouldn't see global sea level rise you would actually see mostly the sloshing or the local effects. So you need to do that global average. But it turns out when we look at what ocean models can tell us that when you look at the bottom of the ocean things get much quieter and especially in the tropics there's so little of this sloshing going on on long timescales but it gets so quiet that if you just measure the pressure you're not measuring the sloshing anymore you are just measuring the slow rise of the ocean as the ice melts. Sue Nelson - If you're measuring the pressure down, a force down on an instrument on the sea floor, how will that though make a global average? You're going to get a different measurement on the other side of the world. Chris Hughes - That's the surprising aspect of it. I think of it like a little bit like when you're filling the bath. If you turn the taps on and look near where the taps are you can't actually tell whether the bath is filling because there's so much splashing around going on, but if you look a long way away all the ripples are damped out and there's just a gradual creep of the level up the side of the bath. That's what we're doing here, we finding a place where all that splashing around isn't really influencing what we see. So all that's left is the global average. Sue Nelson - Right then, let's get to the nitty gritty. What will this instrument consist of and how are you going to build it? Chris Hughes - Well that's the challenge. The same technology has been used for about the last 40 years which consists of a quartz crystal and the resonance of that crystal, the resonance frequency depends on the pressure but these have a problem, they have got much better over the years but even so when you put them down in five kilometres of water they are still slowly crushed by the pressure so we can't measure these changes in pressure on the very long timescales we would like to. It's not super difficult. We're talking about one in ten million accuracy, so you want to be in five kilometres of water measuring a pressure change equivalent to about half a millimetre. That would be the level we would aim for. Sue Nelson - How deep are we talking about you going? Several thousand metres I would imagine. Chris Hughes - Yes, typically it will be three to five kilometres. You want to be away from the edges of the ocean, so somewhere in the middle and that's the usual depth. Sue Nelson - So if you can't use these quartz crystals what else are you going to use? Chris Hughes - That's where we're asking for ideas. One possibility is using something to do with electromagnetism with light. We know there are great ways of measuring things to enormous accuracy if you're using light so maybe we can do something to do with the refracting index of a fluid which will change according to its pressure. Maybe there is something to do with the speed of sound that we could measure or ideas have been floated about using something which changes phase. Sue Nelson - So this is a science and engineering challenge as well. Chris Hughes - Yes, that's what we're trying to do. We want to get engineers around the world who have just not thought of this as a problem to bring their expertise to bear and come up with innovative solutions. There have to be lots of things that we haven't thought of and we've been stuck with the same technologies, as I say, for 40 years. It's a really fundamental piece of physics; pressure is not a complicated variable. I'm sure there is someone out there who has a brilliant idea that would solve our problem. If we can get these message out so that people understand that there is a challenge and this is what we need I am sure someone, somewhere, has the idea that will solve our problem. 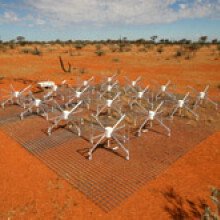 Chris - The precursor telescopes to the Square Kilometre Array are pioneering new receivers to detect astronomical radio waves. Earlier, Ben Valsler spoke to a PhD student called Sarah Thompson from the Cavendish Laboratory at Cambridge University about her research into the physics of receivers to see how detectors like those used on the MRO can be made as sensitive as possible. Sarah - My research is focused on a thing called Kinetic Inductance Detectors (KIDs). These are superconducting detectors that would be used for cosmological or astrophysics observations from the ground or also in space. They're a bit like cameras, but they're not really used for visible light. They're more used for other wavelengths. What I actually research on is we make these devices and we test them in the lab to see how they behave as you change certain elements of their environment. The idea is that we'll get a better understanding of the physics of these devices and then you can make better devices. Ben - So, rather than building a new telescope, your research will enable us to build better telescopes in the future. Ben - I know that I can pick up radio waves very easily using a bit of old coat hanger that's stuck in my radio. So, what is a superconducting material and why do we need these materials with interesting properties? Sarah - A superconducting material is simply a material which has a temperature at which there's a sudden change in the material. So above this temperature it acts as a conductor or even sometimes an insulator, but below that temperature the properties of the material change so that suddenly electricity flows through it with zero resistance. Basically, in terms of building a device or a detector, you instantly get a lot less noise in the device. Superconducting detectors tend to be a lot more sensitive than non-superconducting detectors and in a world in astrophysics where we want to be able to detect more and more distant galaxies and stars and with things like the cosmic microwave background radiation which is very old and has been traveling since the beginning of the universe, there's not much of that light coming to Earth. So you're only talking about a very small amount of light and you need to have a very sensitive device to be able to pick up that light and give you an accurate image. Ben - With optical telescopes, of course, the way that we've done that is to get bigger, to get bigger mirrors, bigger lenses, larger areas to collect more light. Is that the same in microwaves and in radio waves? Are we just getting bigger? Sarah - Yes. If you're talking about the total amount of light collected then a larger array will collect more light. If you're talking about an individual pixel, that's one single detector and if you want to be able to capture a single photon on that single pixel then you need to make sure that a single photon will trigger a significant enough response from the detector that the signal will stand out clearly from the noise and the background of the detector. 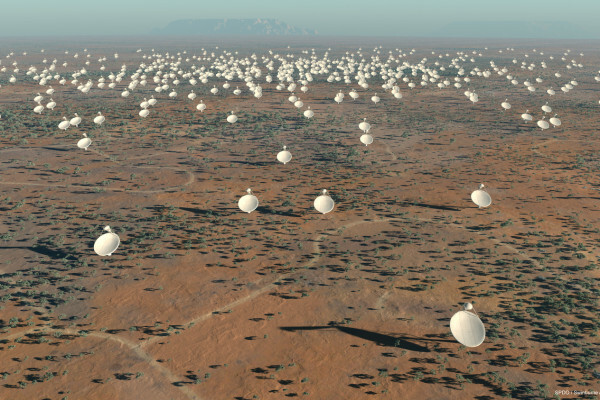 So, not only do you need a large array to capture more total light, you need more sensitive detectors to be able to actually detect that light when it hits the array. Ben - So, we are talking about detecting radiation from the birth of the universe. Ben - To me, I think that would need a very large bit of kit, but you've brought a few things in that are so small that you seem to need tweezers to actually look at them. So, what is it that you've got here? Sarah - One of the main reasons for being interested in kinetic inductance detectors at all is they're very simple devices. You can attach many of the devices to the same piece of readout equipment which is quite rare in superconducting detectors. Often, you need a single readout piece of equipment per detector. If you want to take a large image with high resolution, you need hundreds or thousands of pixels or even tens of thousands of pixels. Now, that's tens of thousands of devices. If each of those devices have their own piece of readout line, their own piece of readout equipment then the wiring, simply, the wiring by itself becomes an unmanageable task! Now, there are lots of different ways of getting around this, but KIDs originally gathered interest because you can attach many of them to the same piece of readout equipment and the same readout line. So technically, it should be very easy to make large arrays of these devices. The reason that my devices require tweezers is because KIDs are very small. 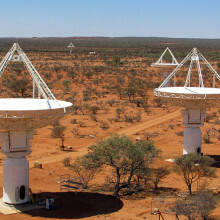 They are on the order of millimetres so even a very large array of them is going to be very small. Secondly of course, this is only a test device, so this doesn't have hundreds of thousands of KIDs. This in fact only has 10 KIDs. So, it's only about 8mm long and 3mm wide. Ben - Well, it looks like a piece of perfectly glass about a quarter of a size of a postage stamp. 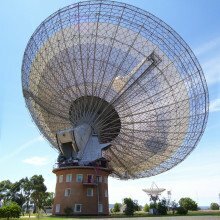 So, that has got multiple receivers that can detect radiation from the birth of the universe. Ben - That's quite astounding. How does that actually work to pick up that radiation? Sarah - With the telescope, you have the aperture which actually sees the sky and then you'll have perhaps a series of lenses which will take the light that was collected by the telescope and focus it on one point called your focal plane. Now at that point, that's where you put your detectors. The KIDs themselves don't actually absorb light particularly well. You have to attach them to an antenna or an absorber depending on which wavelength of light you want to look at and that absorbs the light and transmits it into the KID itself. The KID itself is a really simple device. It's called a microwave resonator. It acts a bit like a notch filter. So, if you look at it over range of frequencies, then what you'll see is an almost flat perfect transmission from the input to your output except at one particular frequency called the resonant frequency of the device. At this frequency, all of the energy that you put in, what we call the probe signal, goes into the device, gets reflected back and never comes to the output. So, when you actually want to read out from a KID array, what you do is you have a series of devices with different resonant frequencies so that your transmission across the entire range almost looks like zero. But then if light hits one of your detectors, its electromagnetic properties change and all of a sudden, its transmission at that resonant frequency goes from zero to very high. And that's how you know that you've detected something and how much the transition changes by and over what kind of timescale, that gives you information about how much energy the light had. Chris - Sarah Thompson who's completing her PhD at the Cavendish Laboratory at Cambridge University. 55:11 - How long does it take for comets to "melt"? How long do comets last before melting away in the heat of the Sun? Will there ever come a time when all the comets are gone? 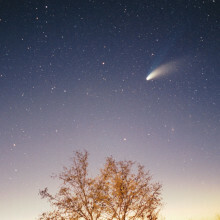 Previous How long does it take for comets to melt?